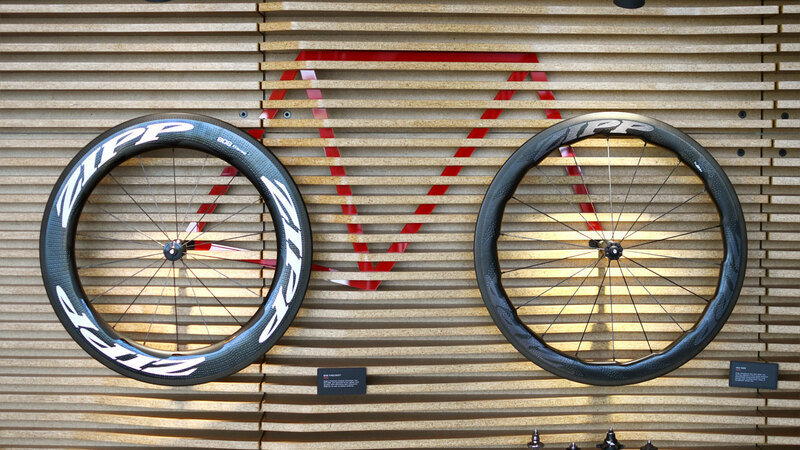 ZIPP is a manufacturer of high performance composite cycling components, most widely known for their carbon fiber race wheels. 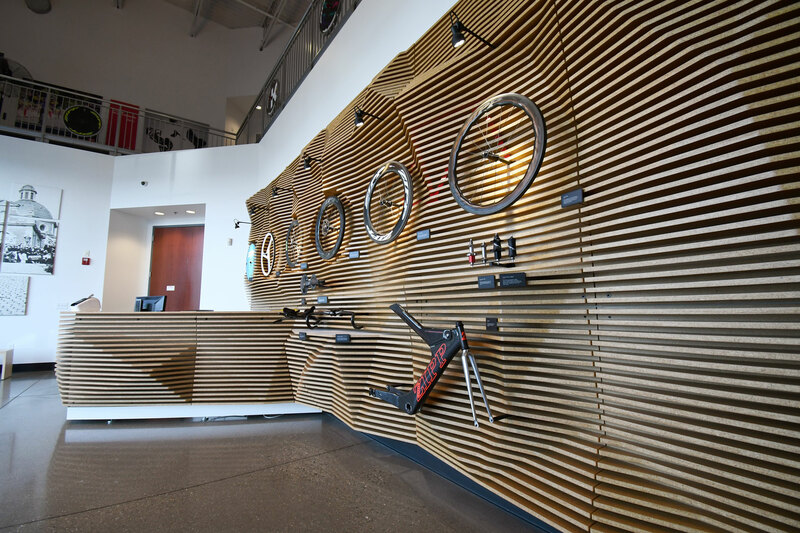 We were asked to develop a system that integrates a display for their historically significant components, a new reception desk, and back drop for the lobby at their headquarters in Indianapolis. Every aspect of the project was considered to highlight the importance of the company’s history and future technological developments. 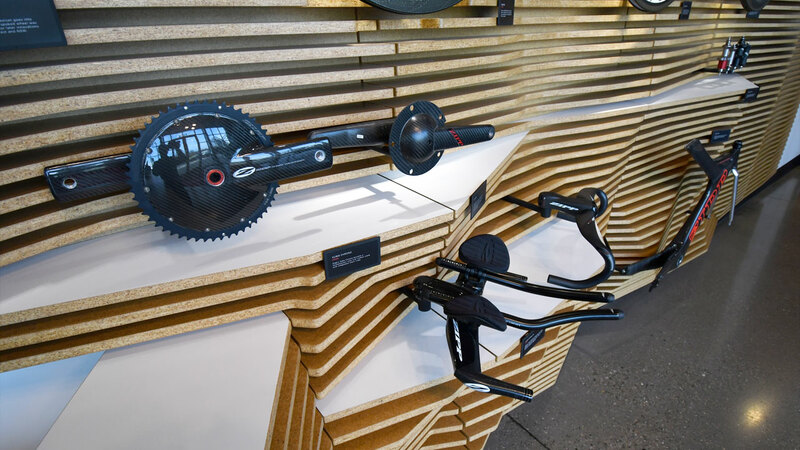 The underlying geometry behind the contoured wall surface is directly influenced by the geometry of a bicycle. 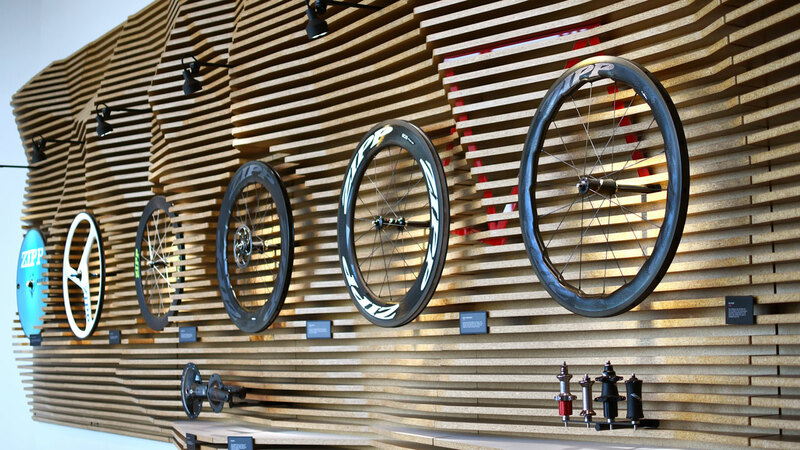 The wheel spacing in the display and the overall triangulation is based on a standard frame, which we have highlighted with an embedded red inlay that showcases their newest two wheels. The contours flow from flat at one end moving in and out to accept specific components, and eventually turning into the new reception desk. Custom mounting brackets, information displays, and lighting were all developed in house to integrate everything into one system. We decided on particle board as the substrate for a number of reasons. Leaving the edge of the homogenous material exposed created an overall uniform mass. 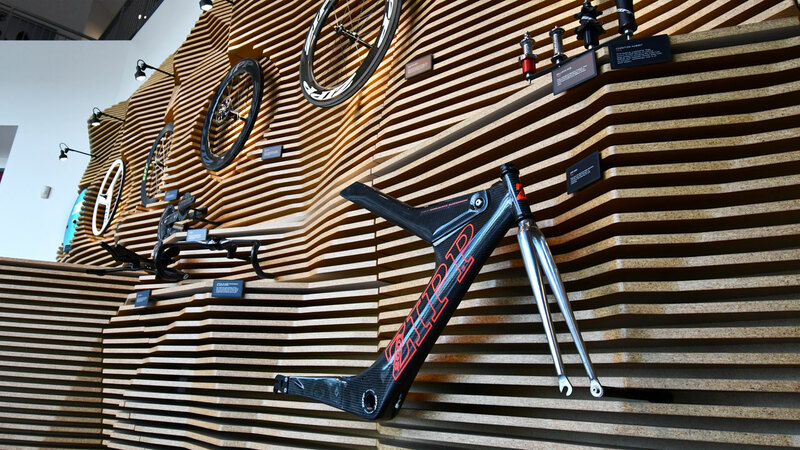 The natural texture and warmth of the material contrasts the man made composite components and allows them to stand out. Each contour was heavily coated with polyurethane to seal and solidify the material. Our goal for this project was to meet all of the client’s needs while creating an artful way of displaying their components. In this way, they are highlighted even more than if they were simply displayed on a shelf. They are an integral part of the work, and directly influenced its design.